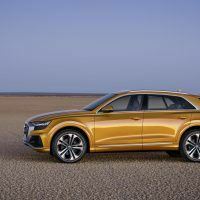 A more in-depth look at the 2019 Audi Q8 can be found here. 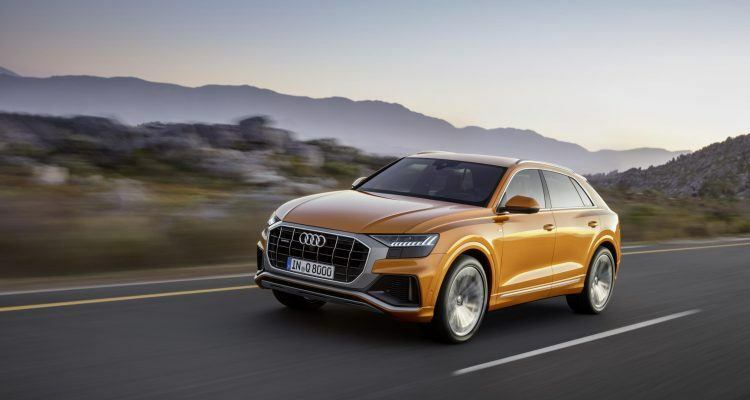 The 2019 Audi Q8 recently made its debut at the Audi Brand Summit in Shenzhen, China. 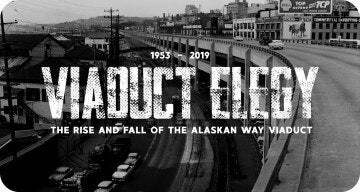 The automaker says the five-passenger SUV will offer advanced connectivity, infotainment and driver assistance systems, and solid on-road capability. 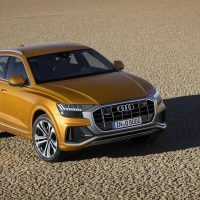 The Q8 will serve as the flagship SUV for Audi, who delivered nearly two million vehicles globally last year. The MMI operating system utilizes haptic and acoustic feedback that should be fairly easy to acclimate to. Similar to a smartphone, drivers will hear and feel a “click” when they activate a particular function. The MMI system can be personalized with configurable and movable “favorites” buttons. A natural-language feature means drivers can speak various requests: “I’m hungry,” for example, will prompt the Q8 to search for and suggest nearby eateries. Those commuting on a daily basis will appreciate the 2019 Audi Q8’s wireless phone charging and Bang & Olufsen stereo. 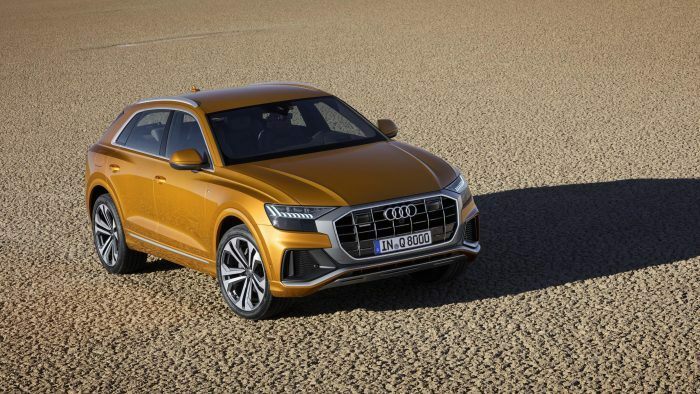 The 2019 Audi Q8 represents a new direction for the automaker with regard to SUV design. Exterior highlights include the Singleframe, octagon grille, contoured air inlets, sloping roofline, and “gently inclined” D-pillars. On the inside, Audi promises plenty of cargo and passenger room as the Q8 is wider and lower than the Q7. 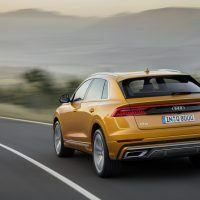 Audi’s signature quattro all-wheel drive technology (no surprise) will be a mainstay of the new Q8. With a mechanical center differential, the Q8 runs a normal power split of 40:60, but when necessary, can divert a substantial amount of power to the axle with the most traction. An adaptive damping suspension is standard but an air suspension with different drive modes is available. A range of engines is likely but Audi did not confirm anything specific in their press materials. 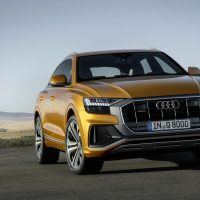 Some reports say the 2019 Audi Q8 will be available in Europe toward the end of this year, with the United States market to follow early next year. Other reports say the vehicle will arrive in the U.S. as soon as this fall. 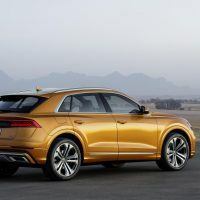 Audi did not officially disclose the release dates or pricing on the 2019 Audi Q8. They did, however, provide us with this short and informative video on what inspired the new Q8’s design. 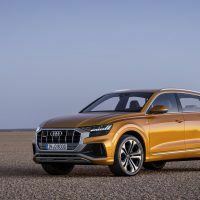 Photos, Video & Source: Audi of America, Inc.
No Comments on "2019 Audi Q8: A Brief Walk Around"